Today I would like to discuss something about knowledge. The first thing I would like to mention about knowledge, is that there are many understandings about the concept. This post does not try to explain knowledge, nor my view of knowledge. It is a concept that is difficult to grasp. Many research has shown that knowledge is difficult to transfer either, for various reasons. Knowledge is often partly codifiable, and partly (perhaps mostly) tacit. Many companies have tried to codify as much tacit knowledge as possible, assuming that this codified ‘knowledge’ is easy to transfer and easy for others to internalize it. This not only feels unrealistic, research has shown this as well. Acquiring knowledge is just not possible from just reading books, blogposts, manuals, documentation, etc. Acquiring knowledge is learning and experiencing from codified information and takes much time participating in the practices and getting your hands dirty. Inspired by John Tropea’s post, (and Harold Jarche’s, Rob Paterson’s and Tony Karrer’s as well) I would like to elaborate on that some more. Context is important in knowledge management (is it possible to manage knowledge? or is it outdated? what is it anyway? aren’t we just talking about learning? well, food for thought and perhaps another story…), even as knowledge creating and eventually decision-making. This is very well outlined and written by Chun Wei Choo in his book ‘The Knowing Organization’. I’d like to explore the concept of ‘Knowledge diversity’ here. Not only because knowledge is experienced in such a diverse way, but because many knowledge workers (I hate these words) are operating in an environment where many disciplines come together. In a place where you are surrounded by people who have different skills than you have, it is less important to share and transfer all that knowledge (if possible at all), it becomes more important to know where to find specific knowledge, if you do not have the skills or resources nearby. If your network is vast and becomes vaster, you might be able to locate resources that can help you out. The question I ask here implicitly (well, I just externalized it in a way I suppose) is how to organize yourself in an environment where knowledge is located at many places (scattered), and where that knowledge is diverse. You can be quite sure that the person or persons you need are out there, so it should become easier to locate these resources whenever you need them. Is this ‘knowledge management’ (again, a very diffuse term)? Or is it a step to self-organization in an environent where the required ‘knowledge’ is out there? Are we in an environment where knowledge is diverse (considering people, location and type of knowledge), and is it important/desired to be able to locate this knowledge somehow? I hope this blogpost leads to making this question better, more relevant, or even obsolete, and can help me to a next step: organize yourself in an environment where knowledge is located at many places (scattered), and where that knowledge is diverse. Panarchy, governance in the network age? The essay of Hartzog, which is a highly recommended read, explains the theoretical backgrounds and some real-world examples. I’m not an expert on this subject, but I do believe that we are reaching a point where other types of governance are better alternatives as opposed to hierarchical ones. I believe that global crises are about to occur much more often and that we should accept the fact that crises are a characteristic of our modern time. Instead of dealing with crises like we are doing today, that is fight them and trying to reach a stable equilibrium like we were used to do in the past, it is time to accept crises because of the properties of panarchy (such as complexity, networks and connectivity) are increasing and increasing, making the world more and more complex. This situation asks for systems that are complex as well, and not rigid, but rather flexible or fluid, like water that adapts to its environment. Water is a great metaphor here, it is strong, adaptive, and has some characteristics that always work within the same conditions. If we see situations we call crises now as reality and a logical result of increasing complexity, we don’t have to call these situation crises anymore. So can panarchy be something like governance in the network age? That is a question which I find quite hard to answer. Is it a form of governance that encompasses all other forms? Or better, is there a form of governance that encompasses all other forms? Yes, you can call the shift panarchy if you like, but what’s the use of that? The paper I referred to does a great job in explaining what panarchy is, and Hartzog argues that it has the potential of becoming the dominant form of governance in the future. The importance of debates like this in my opinion is that many people still work and make big decisions that worked out well in earlier times, but not that good in the present time and not all in the future. The shift that we’re in, that the world is in, ultimately will lead to different modes of organization and governance. Power is more distributed, people are more connected and knowledge is created and transported in networks. Maybe one of the most important things that is happening, is that decision making is changing. It is changing in terms of who are able to make decisions because of where the knowledge is available, who can make the better decisions because of where the most accurate knowledge is available, and who are able to distribute the knowledge to let others make the decisions. Ok, admitted, the end of the previous paragraph is nothing more than elaborating on the beginning of the previous paragraph and does not directly contribute to the main question here, but that is because (tacit) knowledge and decision-making are closely related to complexity, networks and connectivity, or panarchy if you like. And if the best decisions should be made, governance is important as well as organization. In addition to heterarchy and wirearchy, can panarchy help us as well? We all know that hierarchical organizational forms are less and less effective and realistic at the present time. Even in the past this form of organization was being criticized by many. Power and authority are not exclusive for the top of the pyramid. People in organizations form relationships with more people, from inside and outside the organization. Organizational bounds are blurring, and the same is true for the bounds of departments. People choose with whom they interact, communicate, and who they trust. Hierarchical organizational forms do not fit in this picture. A dynamic two-way flow of power and authority, based on knowledge, trust, credibility and a focus on results, enabled by interconnected people and technology. This definition of wirearchy explains how many people use the web to communicate and organize things. It’s emerging, it’s reciprocal, it’s about trust, it’s about learning and about creating knowledge. And about many more things. The most important characteristic is the flow of information. Information now flows more like water or air, which means it can reach us all very fast, like an epidemic. Key is to negotiate meaning with each other to learn and to gain knowledge, using the continuous flow of information. Answering these questions is difficult, and perhaps not even needed. Predicting the future is something from the past. The world is changing too fast for that and uncertainty is too high. So discussing these subjects stays very important, in our way to understand what is going on, to learn from each other, and to stay in a constant dialogue. Is that what organizations should be after? Just have the conversations started, nurture it, and then just never let go of these conversations? Maybe it is. This can spur an organic growth of a constantly changing dynamic network. Therefore I would like to add something to the concept of wirearchy: the dynamic two-way flow should be never-ending, constantly reciprocal, in order to be dynamic and foster learning. Spending some time abroad as I just did in Thailand where you have to speak with the local population in English, when both of you aren’t native English speakers can sometimes result in funny misunderstandings. Not a problem at all, because you mostly just want to order some food or try to arrange some accommodation. In many occasions you end up with what you intended, or something close to it, because you can interact directly, and as a tourist the context is often not that difficult. When you think about online means of discussing, debating, or other kinds of asynchronous communication, it is hard to express yourself as you precisely mean it, and maybe even harder to interpret the text in the way the sender meant it. It can get even more complicated if there is being a response which is asynchronous as well and that communication suffers from the same expression and interpretation problems. While these ‘problems’ can result into unexpected (and sometimes brilliant) responses, it are the disadvantages of written text. Not to mention the misunderstandings because some people are not native English speakers, assuming the text is written in that language. The discussions about systems in earlier posts suffered from these problems as well. I’m convinced that the most of us do not vary that much in what we really mean, however there are some nuances in comparing an organization with a system or not, for example. While these discussions are very fruitful, and we share insights that can make us think slightly different about these subjects than before, there is a fundamental problem that is hard to overcome: written language. The problem with written language is that it comes too short in expressing yourself precisely as you mean it, and it comes short again when the written text is interpreted by the reader. By that time, at the least there are already two moments that change the initial meaning of the author. Hence, a picture is worth a thousand words. The Internet is a place where many communications exist as asynchronous written text. This type of communication suffers from these shortcomings, and is an area where many improvements can be made. The theories of knowledge management can be useful here, for example, how do you deal with tacit knowledge? Can it be externalized and how? How do we make sense of the information that we have access to? What other information or knowledge do you use when interpreting new information? Just some questions that illustrate the problems of written language. Written language alone is often not enough for exchanging information learning, it are the (social) practices that makes us really understand and learn. Why do some social media initiatives make it, and others not? The success can’t be assured a priori. Take the example of FriendFeed. I never used it, but the technology was outstanding people say. It was the first service that made use of realtime updates for example. Of course, for the founders things turned out quite well, because Facebook acquired it recently. For open social networks, mass is needed. People can choose their service freely, and positive network effects strongly influences who will win or lose. The more people you know use Facebook, the more likely it is for you to use it too, and to abandon FriendFeed for example. You’re not really locked-in like you are with using Microsoft Windows and Office, although that latter lock-in is declining with the advance of free web-based alternatives. It is different for corporate social networks. First, it is less social. Not everybody in your life can be connected, just your colleagues. Second, there are mostly no alternatives available. The company chooses to introduce an Enterprise 2.0 application, custom made or out of the box. It’s there just for the company. Third, for the most people, it will only be used during working hours, not very much in the weekends. Fourth, it serves different purposes, like more effective collaboration, not just sharing cool things or experiences that are very funny. However, when people share those it’s a sign they feel comfortable out there. Fifth, there are even more differences. All these differences are a given, and are important when designing and introducing a corporate social network. Traction Software explains it very well on their blog. INNATS. It’s Not Not About The Structure. Structure is important, but too much structure is a problem, as well as too less structure. Hence Not Not. Starting from scratch is not a good idea, but reinventing the wheel over and over again isn’t either. The right amount of freedom to be able to express your creativity, to find the right information in the chaos, and coming back for more on a regular basis because it contributes to your job and the tasks you have, that’s an important factor for success of a corporate social network. Setting the scene is what it’s about. Or better, knowing scenes a priori that could be the starting point of a flourishing corporate social network. You never know if it will flourish, but it pays to look for the right balance between coordination and chaos. Like with open social networks, positive feedback can make it happen faster once the right balance is found. And the initial state of the network has great influence on what wll happen later on, like the butterfly effect (great movie btw). Collaboration is inherently composed of two primary components, without either of which collaboration cannot take place: social negotiation and creative output. [..] Another caveat to the second primary component, creative output, is that the output may take the form of an ongoing process instead of a final conclusion. An example would be an intimate relationship—the parties involved may collaborate very closely towards the successful continuance of the collaborative process. If we translate this to collaborative software, it should therefore not just be goal-orientated, but collaboration orientated as well. Multiple types of output during the process of collaboration can be good, there is not just one single output that’s acceptable. That said, there must be an initial purpose to start the collaborative process in the first place. Why do we start collaborating? I think it’s the best suited strategy if many people are involved and needed to create output, to generate possible solutions to problems, when people can choose to enter or leave the collaborative process, when access to the process is open to all collaborators (in a stigmergic way), and when new problems can come to surface during the collaborative process. The latter enables the continuation of the process. In practice, the most important thing is to get the conversation started. Once it is started, it is easier to have it continued. So how do we get the process started, and have it continued and even sustainable at online collaborative spaces as well? So who do we start with? Just lead-users or as many people as possible right away? What are the traces that are set in the beginning? What are barriers to enter or how do we remove those barriers? What are the triggers for people to embrace the common subjects? What kind of output are we after? When can people step out of the process and can others step in? When is it self-sustainable? All above questions are valid, probably hundreds more are. But it all starts with the same problem, how is the conversation getting started? Is it a big-bang or is it evolutionary? After that, in short, my pledge on collaboration: The journey is the destination…. My name is Bas Reus. 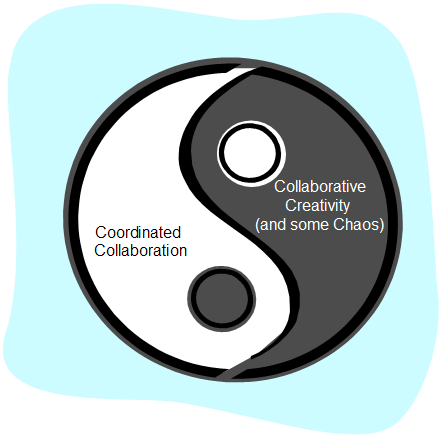 This blog is really a quest on self-organization and online collaborative spaces. Please join me during this journey. How do we make the shift from individual to group social capital? Social capital measures in dynamic social networks? Sharing and buying, what’s our currency? JoseUnige on Crises, what’s next?